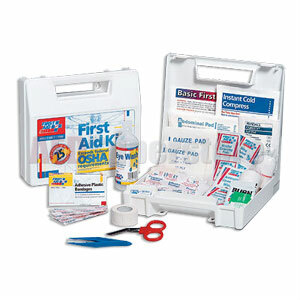 This 106-piece, 25-person bulk kit meets all OSHA and ANSI standards and is designed for use in small offices, vehicles and work sites. The partitioned, water-resistant plastic case is wall-mountable, yet has a handle for easy carrying. Meets ANSI Z308.1-2009 requirements.